On these post there are two types of apps, the ones for your computer and the ones for your phone. It´s quite frustrating at times that you can´t post on Instagram from your computer or you may want to change something on your pictures with some software you have on your computer. With Gramblr this trouble ends. You can easily upload a picture from your disk, edit the title and then upload it. Bear in mind that you will need to resize the picture in order to fit on Instagram it needs to be 650×650, but follow the link bellow to the another tool that does that for you. 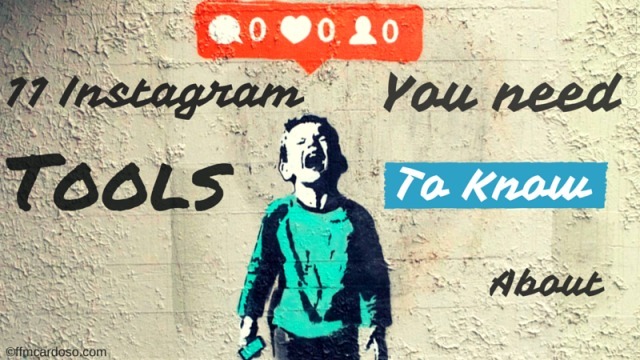 Have you ever wonder who´s not following you back on Instagram. Well, with JustUnfollow that can be unveiled. You can check who´s following you and who´s not and you can unfollow people that does not reciprocate your following. If you want to gain more followers, JustUnfollow gives you also the option to copy followers from other accounts. Iconosquare is probably one of the most powerful analytical tools for Instagram. However is only useful if you are interested on knowing your account’s stats and want to optimize it. With this tool you can check which filters work better, top hashtags being used on Instagram, graphs with engagement on your account, a monthly report on your stats and much more. Have you ever tried to upload a picture and were forced to crop out something that you didn’t want to? Everyone had this problem before but is sorted easily with Instasize. A very simple app for iOS and Android that allows you to redefine the size of your picture in order that nothing is cropped out on Instagram. Very smooth and simple to use. 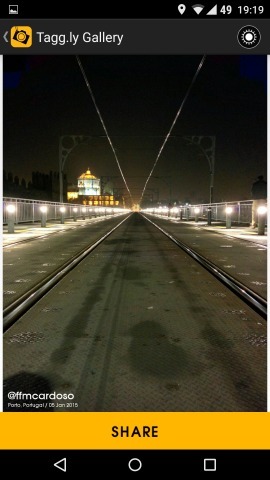 You can also create multiple photo compositions to publish in just one photo. A pretty neat app. On Twitter you retweet, on Facebook you share and on Instagram you Repost. You can´t do that on the native app of Instagram, but you can use Repost. Have you ever felt like sharing content from other Instagramers on your account and though it would be impossible to do? Just download this app for iOS or Android and start reposting other peoples’ content. You can search for content on your feed or a limited search on the pictures you previously liked before. A good thing of this app is that it gives full credit to the person who took the picture. 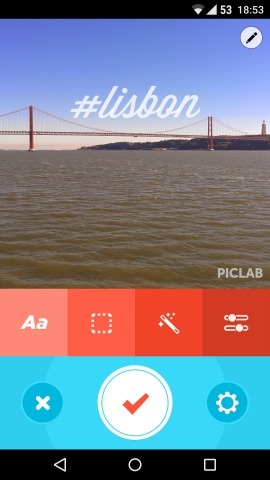 Piclab is a tool that allows you to add text to your picture. If you want to have written information on our picture this is an awesome tool to do it. There are quite a few fonts, shapes, filters and a wide range of add ons. The app is free but there are app-in-purchases. A very complete app to add a bunch of effects to your photos. 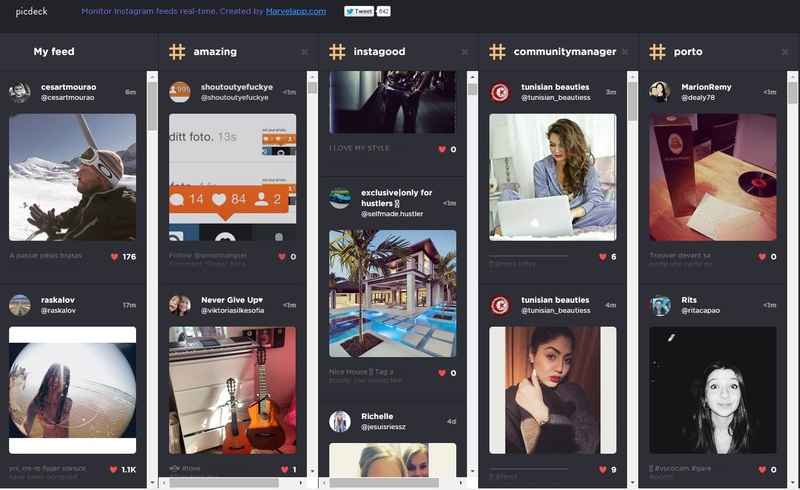 If you are addicted to Instagram and want to follow hashtags, this web tool is perfect. This is sort of a Tweedeck look a like app but for Instagram where you can get a feed for hashtags or specific users. It’s a very simple tool but could have a bit more of interaction, nevertheless it does what is meant to. Tagg is an app created by Tim Pool and his friends and does what is says, which is to add a tag to your picture. So, if you want to automatically add your name and location to the picture, this app does it for you. Is a cool way to credit your pictures and make sure they travel on the social media networks with your name on it. You can also add your company’s or personal logo to the picture. The app’s design is great and very simple to use. Hyperlapse is one of the best apps of 2014, and is made by Instagram. Very, very sadly is still only available for iOS. Android users are patiently (not) still waiting for it on their devices. The time lapse concept is not new and there are quite many apps out there that do time lapse videos, but none does it so well as Hyperlaplse. Due to built in stabilization technology the result is quite impressive, and the quality of the time lapsed videos is simply stunning. I only came accross with INK 361 very recently, but it’s for sure a tool that I´ll be using more in 2015. INK 361 is a beautifully designed app that combines a bit of a few apps I’ve mention before on this post. It has a deck like Picdeck and the stats from Iconosquare and a much better screen than Instagram to visualize your feed. You can also explore popular and trendy accounts as well as an Editor’s choice. If you really like a picture from an Instagramer you can also get it framed and bought it through this tool. Another cool feature is that you can create circles (similar to Google +) in order to organize people you follow based on the themes you want to choose. There’s certainly a lot to explore on INK 361. This is a list of a bunch of tools that I think that can improve a lot your connection with Instagram. There are no favourites, all are amazing tools to improve performance, management and engagement. What’s your favourite one? Which one did I miss and should be on the list? Drop me a line on the comments. Enhorabuena Francisco, otro post más sobre Instagram, te vas a volver un Pro en esa plataforma! Ya te veo en Influencer en un futuro corto :). Me gusto mucho el post con unas herramientas muy útiles! También me gusta mucho las fotos que utilizas, a parte de ser un artículo con una cantidad muy buena de contenido escrito. Ahhh y la foto de portada muy chula (Bansky?). Saludos y espero ya el seguiente, sobre Instagram? You might have just rejuvenated my interest in Instagram! I am not a fan of mobile apps, and hence any app that allows me to upload pictures from my desktop is GOLDEN! Instagram is a very interesting platform. Check my other post on the 25 accounts to follow in 2015, you will find many interesting people doing amazing stuff. By far the most important platform in 2015. Thanks so much for sharing this. Is there an app / software I can use on my computer to edit text or type in text under my photos in Instagram. For example: My instagram crashes on my phone often, even after several re-installs. I prefer to use my computer to type in text anyway – which is why I like facebook. Basically I can post the pic ok, from my phone, but then after that it’ll usually crash, so the option to type in what I need too takes way too long, or I have to delete it completely and start again. Am looking for a option for Instagram that I can use on my computer and skip the whole phone drama. I’m super keen to learn and implement Instagram – and hoping to find a solution. Thanks for dropping by and commenting. To be honest Mandy I am not aware on any app like that. Instagram is build natively to phones and you can get it´s best use on a phone by all means. My advice is to replace the phone. 🙂 Your phone is clearly giving you problems and not running Instagram properly. That´s brilliant! 🙂 Any question just let me know. 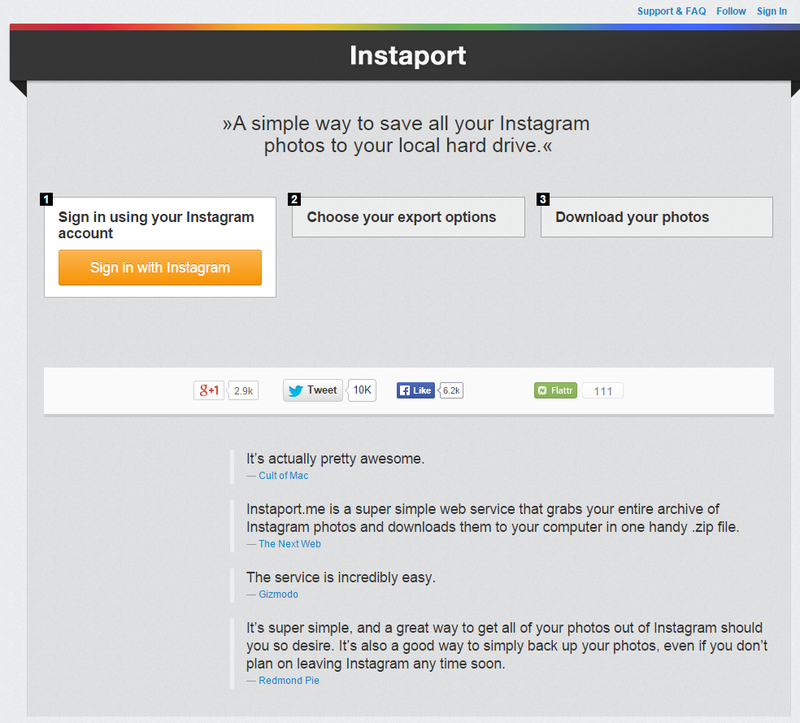 Who are use the tool for scheduled posting to Instagram? Our smm-specialists are using onlypult.com now. Tengo una duda Francisco, he leído algunos posts antiguos respecto a Gramblr, que dicen que su uso te daña la cuenta y la posibilidad de usar hashtags. En tu experiencia has tenido algún problema con Grambler? Saludos y gracias por tu gran artículo! Hola Juan, nunca he oído eso la verdad. Es cierto que instagram es muy pesada es no deja hacer muchas movidas con la Api. Pero últimamente probé latergramme y me funciona genial. Tendrás que usar el móvil para subir la foto. Pero las subes desde el ordenador con el copy también. Funciona de maravilla. Pruébala. Un abrazo y gracias por pasarte por aquí. Gracias Francisco, de hecho he estado probando Latergramme y es como tu comentas, genial! Mucha suerte y gracias por tu respuesta! Thank you a lot for amazing post with awsome list, Francisco! I’m using Instasize and it’s perfect! Just for the record, I’ve felt annoyed that every time I post a photo on Instagram my photo gets cropped. By the by, zengram.net is also usefull app. For boosting followers 😀 it finds potentially interested users via hashtags and g-location. Ultimately, i’m having real followers. Btw, Schedugram is a way to easily manage Instagram.